Goal: Increase access to health services. Navigating the system of benefits and care available can be time-consuming, confusing, and complex for anyone. We support programs that assist clients with enrolling in public benefits, such as Medicaid and SNAP (food stamps) and help people find providers for the services they need to stay healthy. We want to live in a community where everyone, regardless of income, can access health care. We support programs that provide primary care, dental care, mental health care, and substance use disorder to low-income residents. Our partners at Food Gatherers distribute at least 6 millions pounds of food per year through their extensive network of food pantry and congregate meal partners. At least 50% of the food distributed is protein, fruits and vegetables. We support Washtenaw County's food bank and food rescue organization to alleviate hunger. Healthy food is great, unless you don't know how to cook it or don't know why it's important to eat a variety of fruits and vegetables. We support programs that ensure people that have access to all that fresh produce distributed by Food Gatherers also know how to cook it and serve it to their families. Individuals that are unable to leave their homes can suffer serious health declines from a lack of proper nutrition. We support programs that deliver nutritions meals (hot and cold) to home-bound, low-income residents so they can maintain or improve their health. Healthy people are the foundation for vibrant, productive communities. Washtenaw County ranks first among Michigan counties in “health factors” according to the 2014 County Health Rankings released March 26, 2014. However, even in Washtenaw County, where you live affects your health. While Chelsea residents can expect to live up to age 85, which contrasts starkly with Ypsilanti township, where the average life expectancy is age 661. Further, while infant mortality rates have improved overall, black babies under one year still die at almost twice the rate of white babies in Washtenaw County2. 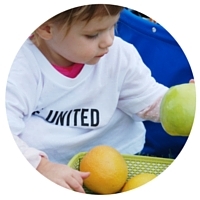 Give: Make a donation to our Health & Nutrition work. We are local dollars changing local lives. Volunteer: Your time can be valuable for our nonprofit partners that champion health equity or our food system.